On aimerait appeler dessins ces collages fins et acérés. Le geste se manifeste ici comme rarement dans le travail de Simone Rochon. Organique, le trait semble reproductible. Les formes fléchies posent un indécidable entre rigidité et souplesse. Les compositions, ni abstraites ni figuratives, rappellent les collages modernistes : des membres improbables sur un objet tronqué, jouxté au journal de la veille. Le fond intouché laisse paraître la matérialité du support, jusque là gommée par l’artiste. Celle-ci affirme s’éloigner d’une volonté de réalisme photographique, pourtant elle se rapproche de la facture, de la volupté de ce médium. La lumière n’a pas de source dans les œuvres de Simone, et les objets qui s’y retrouvent n’ont pas l’habitude de la transparence. Dans la présente série, les papiers s’apparentent aux pellicules déposées sur une table lumineuse, ou aux radiographies consultées sur négatoscope. La duochromie des éléments collés rappelle le négatif et ses manipulations en chambre noire, mais aussi certains effets obtenus en postproduction numérique. Ou le tracé d’un pinceau mouillé sur un papier photosensible. L’évocation de la photographie argentique se sent jusque dans les textures subtiles des ombres, finies à l’encre métallique. Difficile de percevoir une référence à l’échelle. Seules quelques ombres portées, flottées, nous rattachent à un vague horizon. Les ombres souples sont parfois celles des traînées d’encre, tantôt celles de réminiscences matérielles. Des impressions de volumes angulaires résolvent nos désirs de tridimensionnalité. Elles tendent vers l’espace sculptural en trouvant leur assise dans l’aplat, tandis que les ombres demeurent dans la dimension du papier. Les sculptures installées confirment ces tensions. Les pincements, torsions, plis, déploiements et renflements forcent les deux dimensions à devenir trois, en restant malgré tout un peu deux. Comme souvent chez l’artiste, une surface en révèle une autre : le négatif, son envers. Le matériau précis et léché contre (tout contre) son ombre matte et texturée. "She once suggested to a respected, successful, and generous curator that a particular artwork be included in an exhibition alongside another. The curator dismissed the suggestion without pause: 'those works are too similar, it’s too obvious' he said". A Few Similar Things presents what its title suggests; it comprises four pairings of similar works, made autonomously by different artists. Mounted in vitrine spaces throughout the Arts Commons +15 pedway in Calgary, each installation is a coupling of works that in some way—aesthetically, conceptually, formally—are forthrightly alike. Simone Rochon’s Le plein du vide no.3 (2015-2016) and Maggie Groat’s Proposal for a Monument (2013) both explore the tenuous relationship between architecture, monumentality, and fragility. Rochon, taking cues from the dreary and unremarkable aspects of utilitarian architectures in urban Montreal, painstakingly paints discrete paper surfaces. From there, her wall-paper like paintings are dissected and collaged to make precariously stacked structures and forms. In quoting a tradition of Cubism in her disjunctive forms, while employing an aesthetic of careful and gentle painterly surfaces, Rochon undermines the machismo typically associated with such Modern traditions of painting and architecture. In this gesture, there is a vulnerability that speaks to an unfurling of monumentality. Groat’s collage presents a similar tension: it imagines a vulnerable architecture of the monument. Her practice broadly considers the possibility of alternative futures in a speculative sense, futures that take up epistemologies that are typically marginalized—that which is liminal to monolithic patriarchal structures of politics and science for example, that which is plural and collaborative, and that which is vulnerable. Proposal for a Monument makes manifest these hypothetical aims in collating disparate images to create a new form. Yet, Groat’s monument is not dedicated to war. Nor is it an instrument of totalitarian propaganda. Rather, and like Rochon, it is a monument to a future wherein a diverse number of alternative forms of knowing provides the foundational structures of our existence. On the threshold. The space that opens up before us, as we step out of the aisle: a self-contained whole. At the outset baffling, its essence can be discovered by wandering about. The Hall, by Caroline Cloutier, is the setting for New Lines of Gravity by Simone Rochon, while the latter’s sculptures act as a link between the virtual spaces that have been created. The tenuous boundaries between the works evoke certain common features of the two artistic practices: trompe-l’oeil, imitation, architectural forms and assemblage techniques. The space within. While the feeling of immersion at first surprises the viewer, this makes it easier to deconstruct and turn attention to the uniqueness of each of the pieces exhibited. New Lines of Gravity is a series of works incorporating drawing and collage, that present supple, flowing shapes interrupted by angular forms. They are suspended in a boundless, sidereal dimension. A collection of strange celestial bodies, these artworks explore a relationship of uncertain scale. By means of an in situ installation, The Hall seems to extend the confines of the booth to a minimalist architectural space. The marble floor introduces a baroque note that is echoed in the artworks comprising the installation. Caroline Cloutier's work reaches out and surrounds us, playing on our sensory perception of the space in which we find ourselves. Illusion and imitation. The found and fabricated textures in the artworks imitate materials and surfaces that are peculiar to architecture and sculpture: marble, metal, stone, plasterboard and fabric. The fragments created and assembled by Simone Rochon in New Lines of Gravity are reminiscent of the raw materials of construction—large surfaces broken into pieces and then organized to create volumes and spaces. As for the elements represented in The Hall, they play on two layers of illusion. For a moment, the flooring also leaves us confounded as to its true nature. Composed of a photomontage of marble and its colourless negative, it too references a construction material and is reiterated and organized according to certain conventions. However, concealing the imitation is certainly not the intent of either artist. Indeed, the revealing of this process of duplication is precisely what gives layers of complexity to these montages. Beyond the trompe-l’oeil effect, the counterfeits serve here to explore the mediums and their countless possibilities. This carrying over from one technique to another can be observed in Simone Rochon’s work. 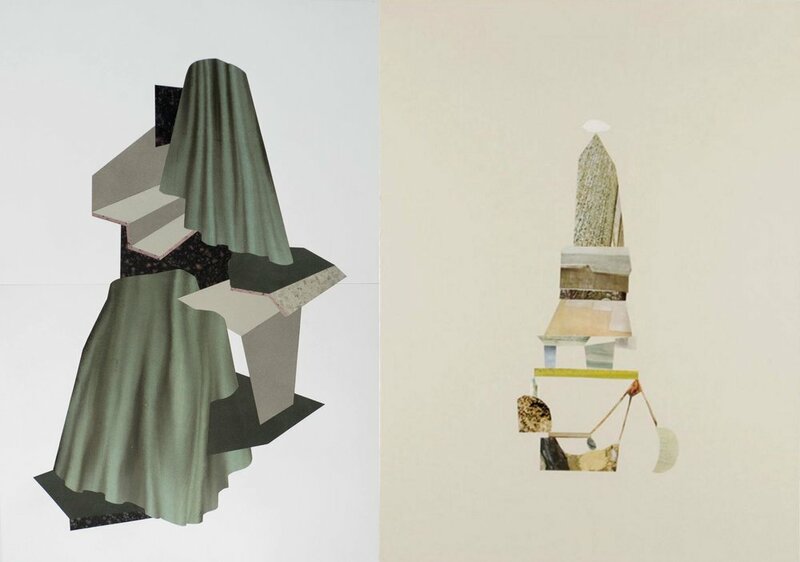 Her objects--volumes constructed by combining flat surfaces--have been selected for their physical properties, which resemble the textures created for the collages: supple and flowing, as well as hard and refined. In Caroline Cloutier’s work, such considerations are apparent in selections that are reminiscent of the language of painting and its reproduction: the colouring of the wall surfaces with self-adhesive vinyl prints, the all-over effect created by the flooring, the mirrors mounted to add dimension and, finally, the use of giclé on canvas. What the works of Caroline Cloutier and Simone Rochon have in common is their tracing of an imaginary horizon. They challenge the visitor facing a traditional exhibit booth by initiating an intimate dialogue between their works. Each in her own way opens up the walls and suspends objects in an unfamilliar, unconfined space.